NYC, 02/06/2019, 7:00PM. 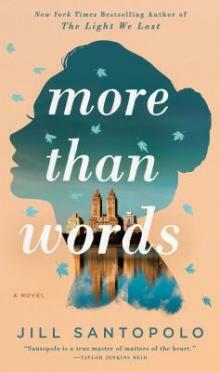 More Than Words: A Dead Father's Secret. Nina Gregory has always been a good daughter. Raised by her father, owner of New York City’s glamorous Gregory Hotels, Nina was taught that family, reputation, and legacy are what matter most. And Tim–her devoted boyfriend and best friend since childhood–feels the same. But when Nina’s father dies, he leaves behind a secret that shocks Nina. Jill Santopolo is the author of The Light We Lost as well as three successful children’s and young-adult series, and works as the Associate Publisher of Philomel Books, an imprint of Penguin Young Readers group. Jill travels the world to speak about writing and storytelling. She lives in New York City.